this counter let your create free global counters that you can put on your websites. A global counter is a counter which include various counters in one. This global counter include a online counter, a page views counter, a visits counter(last 24 hours) and a visits counter(since the counter is active). 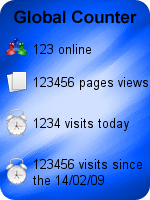 The global counter is available in several styles. You can chose a style by clicking on it. 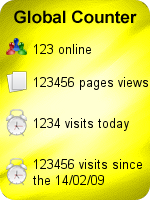 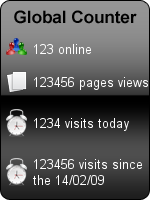 You can also configure the initials values of the counter, the number of the pages views and the number of the visits. Then you have to click on the "Create" button. Your global counter will be displayed, a (X)html code will be generated and the URL of the image of your counter will be generated. To add a global counter on your web site, you only have to copy the generated (X)html code. You can also use the image URL to add the counter on miscellaneous platforms. 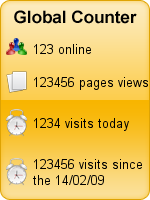 You can use this counter without registrate on Webestools. This counter is 100% free.